Hello! I am Dottie Boscamp, the only employee of my glassblowing company, Glass Rocks. 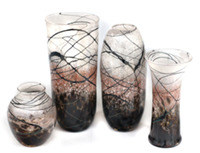 You will find my art glass to be very well made and affordable. I have been blowing glass for 18 years and hope for another 18 to come. One of my best selling products is the funtional kitchen item - oil or vinegar bottles. The lightning series is also very popular. New for 2019, these starfish bowls are a hit! They have a conglomeration of color in the middle with white lines of color that lead your eye to the pointy tips on the edge of the bowl. These bowls also look great hanging on a wall. Functional and artsy, the soap/lotion dispensers are a great seller. Great in the kitchen and bathroom. There are twelve colors available, same color mixes as the oil bottle product line up. New for 2019! The original aqua lightning series has been very popular so I decided to make an earthy, brown version. Ivory glass color fades to an opaque light brown and ends with a deep root beer color. The black, graphic line drawn on the piece has a special effect that keeps your eye traveling all over the vases. These vases have matching bowls that are available as well. These unique vases are made with a variety of color techniques. 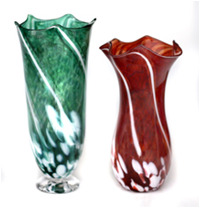 Glass color is applied in powder form, gravel sized pieces, and stripes. 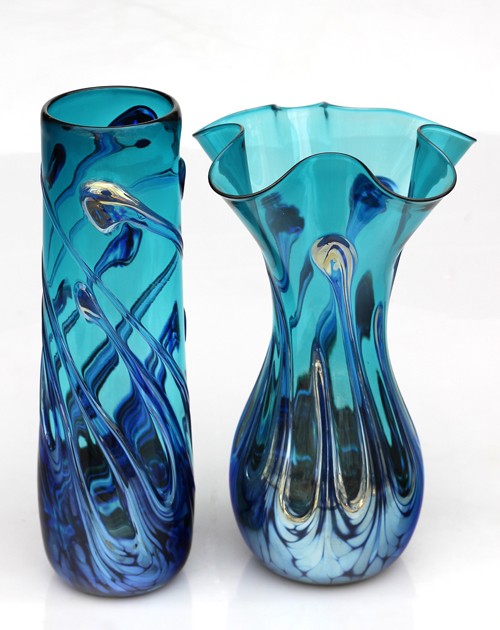 Both style of vase is available in blue, red, or green. 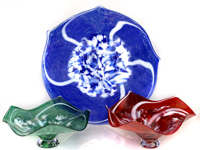 There are also matching bowls in small or large size. Best selling products of 2018. 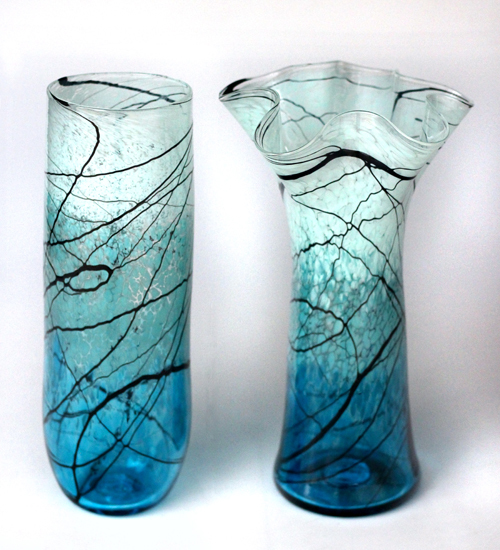 The celadon and turquoise color show off the black, graphic line very well. 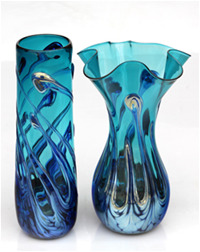 These eye-catching vases have matching bowls and smaller vases that can accompany the large ones.